He isn’t a pilot, but few people would know more about ways of navigating while flying than Prof Mandyam Srinivasan (Srini) of the Queensland Brain Institute. And he’s steadily finding out more. Initially known for his work in bees, since receiving the Prime Minister’s Prize for Science in 2006, Srini has shown that birds and insects use a similar system of visual guidance to prevent themselves from crashing into trees when flying through dense forest. At the heart of this system is the ability to sense how quickly images travel across the eye. The closer objects are, the shorter the time they remain in view. Although simple in concept, this way of measuring distance and speed can be harnessed to achieve sophisticated navigation tasks of collision avoidance, landing and tracking moving targets. It also explains how animals with minute brains can perform aeronautical feats difficult for human pilots with expensive equipment. Srini’s research is a rare blend of pure and applied science. His findings are already being put into practice in designing visual navigation systems for robots and developing autopilots for drones or unmanned aerial vehicles (UAVs). “We’ve come a long way in the past five years,” Srini says. It’s not surprising that his work is supported by a diverse string of sponsors including private companies like Fujitsu, the Queensland and Australian Governments and the US Air Force. 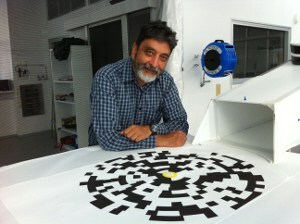 Photo: Srinivasan works on bee navigation: here he is in the All-Weather Bee Flight Facility at the Queensland Brain Institute (QBI).